Being a coveted organization, we have been successfully engaged in manufacturing and supplying a wide range of Anti Mosquito Window. At our well-maintained manufacturing unit, this system is manufactured by utilizing the best quality raw materials with the aid of pioneering techniques under the guidance of our diligent professionals. The offered system is widely used in number of places for providing protection against mosquitoes. Also, this system can be purchased at marginal prices from us. 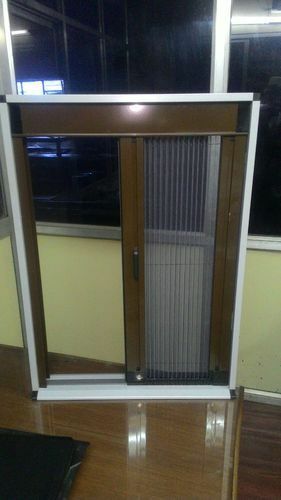 We are dealing in Anti Mosquito Window which consists of Vertical Fiber Glass Rolling Screens. This systems are imported from Europe and are CE certified quality. Ask for a demo / presentation. Established in the year 2008, we “Raj Engineers”, are a Sole ProprietorshipFirm, that is a noteworthy Manufacturer, Exporter and Supplier of premium quality array of Pollution Control Equipment, which consists of Wet Scrubbers for Boiler fly- ash, Oil Skimmer for ETP, Dust Collection System for Sugar / Process House, Cyclone Separator, etc. Our complete product gamut is manufactured using high grade component and innovative technology. For manufacturing of these products, we procure premium quality components from the reliable vendors of the market. These products are valued for their low maintenance, high performance and longer service life. Our complete product array is extensively demanded in various industries for different purposes. In addition to this, clients avail the offered products from us in various technical specifications at industry leading prices. We are also offering Fabrication Services, Project Consulting Services and Pollution Control Equipment Turnkey Projects to our clients as per there requirements. We are exporting our products in all over the world.